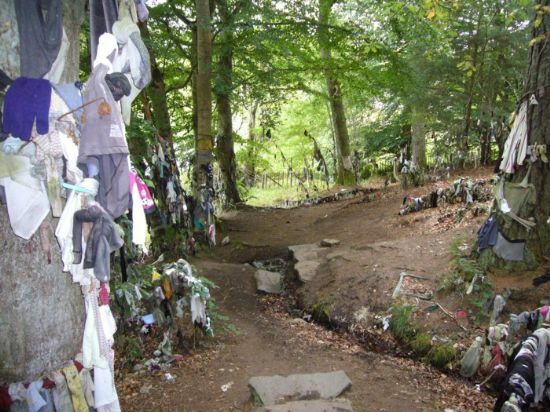 The Clootie Well at Munlochy, also known as Hill O'Hirdie or St. Curitan's Well, is one of two holy wells in Munlochy, and a good example of one which has been reinterpreted through the ages. Today it is arguably an eye sore, with dozens of items of clothing tied to trees and even strung along clothes lines. But at the heart there is a spring emerging from the hillside, which formed a rag or clootie well. At rag wells an item of clothing from an ill person was tied to a branch, and sometimes associated with specific rituals held on only certain days of the year. The sickness was transferred to the cloth, so that no one removed it from the tree, and over time it, and the sickness, would decay. Many holy wells are thought to date to pre-Christian times, adopted later into Christianity, with the wells then associated with saints. In some areas they are also associated with chapels. And indeed it is still visited a century later. No longer do people come on only set days. Even more of a change however, has resulted from the offerings themselves. A century ago and earlier, they would have been of biodegradable fabrics – wool, cotton, linen or similar. But today’s synthetic fabrics will not decay, and many will still be hanging decades if not longer, ensuring that the site is clearly marked as special and indeed archaeological in nature. Holy wells are found throughout the Highlands. Some are known from antiquarian accounts, some from maps and placenames, and a few, like the Munlochy Clootie well, remembered by people. Over 60 are listed in the Highland Historic Environment Record, and there are undoubtedly others which have not been recorded. 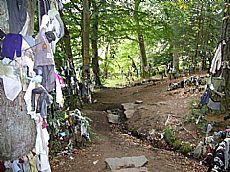 Healing Wells and Springs in the Highlands & Islands – entry on Am Baile by Janine Donald, with a list of some of the many Highland examples. Morris, Ruth & Frank 1982. Scottish Healing Wells.